By 1991, I had decided that I wanted to get into fantasy roleplaying (especially D&D). This idea, planted by Choose Your Own Adventure and Lone Wolf books, had been reinforced by video games like Ultima and Dragon Warrior. I wanted a game where I could embark upon epic quests, slay mighty evils, and acquire great treasures, and I wanted to play it with my friends. I remember HeroQuest being hard to find in 1991. After we found no trace of the game at several stores, my parents started calling stores to ask if they had the game in stock (remember, there was no internet). Eventually, they found a store that had copies in stock. Unfortunately, the store was located on Mckinght Road, known to locals as McKnightmare Road. In order to fulfill this quest, we would have to brave its legendarily terrible traffic during the holiday shopping season. Undaunted, we fought our way through the traffic, made our way to the store, and claimed our prize. Because my parents are awesome. The game was everything I'd hoped. Assuming the role of the evil wizard Zargon (the gamemaster), I challenged my family and friends to brave my various dungeons, defeat my chaos armies, and foil my evil plots. Enormous fun ensued, and I was soon designing my own dungeons. Unfortunately, years later, that hard-won HeroQuest game was destroyed by a leaking pipe. I couldn't simply go to Target for a replacement game, as it had long since gone out of print. Ebay seemed like a good idea, but HeroQuest had become something of a collector's item, and the going price was a little rich for my wallet. Eventually, a friend found an incomplete copy of HeroQuest at a flea market, and gave it to me as a birthday present. It was like being reunited with an old friend. Upon closer inspection, the box that my friend had given me contained not only most of the basic HeroQuest game, but parts from three of the expansion packs (I hadn't even realized that there were more than two)! After a bit of careful Ebayng, I've managed to fill in most of the gaps in the basic set (I haven't started on the expansions yet). It is in this situation that I find myself when I learn of a Kickstarter project to create a 25th anniversary edition of this great game. At first, I was excited. A chance not only to get a complete HeroQuest game, but to get a commemorative, possibly expanded edition? Awesome! Unfortunately, I once again find my desire for HeroQuest at odds with my wallet. The lowest tier that gets the complete game costs US$89.00. Add to this the unpleasant fact of international shipping (another $40-50), and I'm left wondering: Is it really worth it, or should I continue on my Quest for HeroQuest Classic? As I've discussed elsewhere, G.I. Joe was an important part of my childhood. One action figure became two. 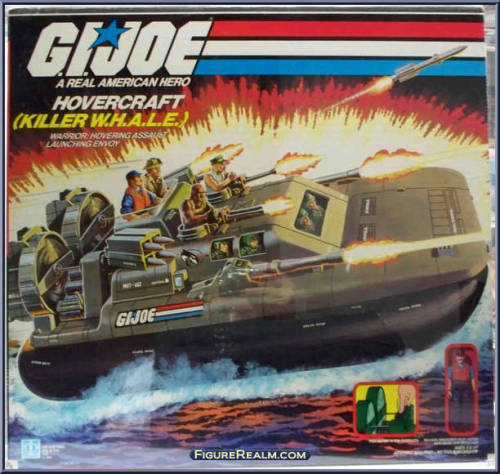 Soon, I was watching the cartoon on a daily basis while playing with my Killer W.H.A.L.E. G.I. Joe was also my initiation to comic books. One fine afternoon in 1987, I was out with my family at a (now closed) mall when I noticed a comic book store. Perusing their brightly colored wares, my attention was quickly caught by a familiar red, white, and blue logo. There was a G.I. Joe comic book? 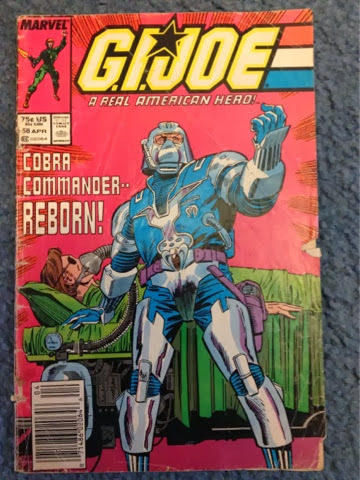 Even more intriguing was the as-yet unfamiliar character on the cover, with the tag line "Cobra Commander Reborn!" Was this a new Cobra Commander? What did they mean by "Reborn"? Was the old Cobra Commander dead? Was this guy the new Cobra leader? Was it just a clever way to say "Check out the new design we came up with for Cobra Commander"? Could I live with myself if I didn't buy this comic book RIGHT NOW? I'm fairly certain I read it twice on the way home. There was a covert mission to hack into a Terror Drome. Cobra Commander was trying, with the help of a Cobra operative, to save his comatose son. These were not the stories I'd been watching on TV. They were better. I was hooked. My brother was hooked. Over the next year, we bought as many issues of G.I. Joe as we could get out hands on. Unfortunately, the allure of new action figures and vehicles soon re-directed our allowance flow away from the comics. Holy crap. I never thought I'd see it again. It's pretty battered, but there it is. The first comic book that I ever bought.